Decarbonising winter space heating in the UK will require a capital intensive heat supply chain running only for the winter months. Policy action is needed to reduce the costs of this. Large scale electrification of winter heating looks to be essential if the UK’s legally binding 2050 emissions reduction target is to be met, with other approaches likely playing a lesser role (see brief notes on this at the end of this post). However electrification of winter heating poses severe challenges. Winter heating uses a lot of energy. Meeting the present heat load with electricity would add about 50% to present electricity consumption in the first quarter of the year – even allowing for the efficiency of heat pumps – and proportionately more in the coldest periods. Indeed, peak heat demand is around 300GW, equivalent to around 100 GW of electricity demand from heat pumps, which is larger than present electricity generation capacity. Furthermore electricity generation to meet heat demand is only required during the winter months. Consequently, capital costs of power plants need to be recovered over less than half the year, assuming no large scale seasonal storage of either heat or electricity is available (lithium ion battery storage helps a good deal with daily system management but does not look capable of helping move the very large amounts of required energy from summer to winter). The excess capacity on the system in summer, including solar, means that there will be relatively little chance of recovering capital costs from sales into wholesale power markets over that part of the year. Export opportunities also look likely be limited as most of Northern Europe has similar seasonal issues. Most low carbon power is capital intensive, so low load factor operation increases costs a lot, making winter-only low carbon electricity expensive. Nuclear looks likely, on a rough-and-ready basis, to cost around £220/MWh for winter only operation, assuming generating plant to meet heating load runs on average for a third of the year. The penalty for lower load factor operation is potentially much reduced if power comes from CCGT with CCS. This is less capital intensive, so the increase in cost per MWh from running at lower load factor is much less. However the cost is still likely to be perhaps £150/MWh for winter only operation, around three or four times present market prices. And no gas power plant with CCS is yet being built, so a huge amount of scale-up of the technology is required. Offshore wind is also capital intensive and relatively inflexible, but benefits from higher output in the winter months. It is likely to be between the cost of nuclear and CCS for winter only operation, although it is unlikely to be possible to run a decarbonised heating system exclusively on offshore wind. Generation from biomass may also have a useful role to play, but again has its limitations. The high cost for electricity is on top of the substantial capital costs of reinforcement of the distribution grid and buying and installing the heat pump itself. In many houses it will also be necessary to replace radiators or install underfloor heating. This is needed to allow the heating system to operate at lower water temperatures than is usual with gas boilers, in order to retain heat pump efficiency. Indeed in less well insulated houses heat pumps may supply only part of the load, with some top-up from natural gas still necessary. 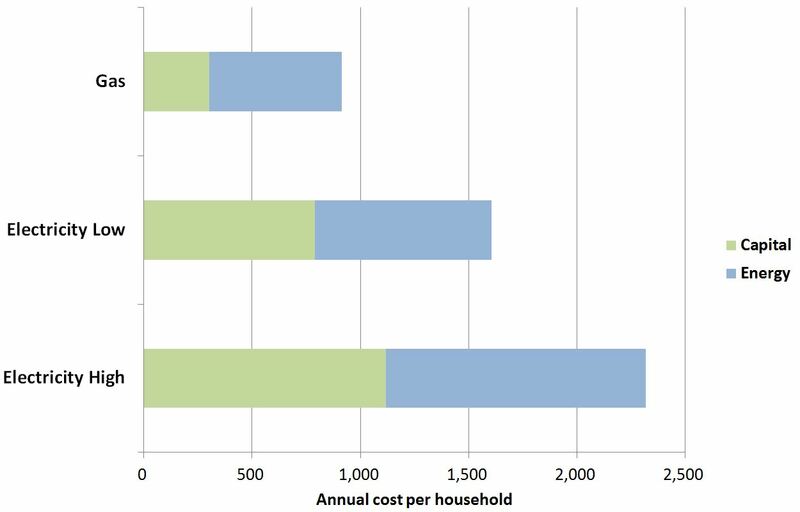 Two cases for total costs are illustrated in the chart below, which compares the cost of electric heating the cost of a new natural gas boiler for household use. To emphasise, these are rough numbers, but likely if anything to understate the problem of high cost. The high case is based on electricity from nuclear, the low case on electricity from natural gas with CCS. Additional distribution costs are assumed in both cases due to the large amounts of electricity that would need to be distributed with widespread use of heat pumps. The additional cost for an average household is around £700-1400 per year. The additional bill for the UK’s 26 million households would amount to £18-36 billion p.a. or around 1 to 2% of GDP. That’s just to decarbonise residential space heating. In practice of course it’s unlikely to apply to all households, but other approaches seem likely to be similarly expensive. Assumptions: Heat pump capital cost of £6,000-8,500 including installation, distribution grid reinforcement and upgrades to radiators/underfloor heating, likely to prove a favourable assumption in practice. Gas boiler capital cost of £2300 including installation. Winter low carbon power £150-220/MWh wholesale, electricity network losses 7%, additional distribution costs included in capital cost of system. Natural gas £34/MWh GCV, gas consumption 18MWh p.a.. Boiler efficiency 85% of GCV, so heat load is 15.3 MWh, heat pump CoP = 3. Required rate of return is 10% with 15 years. Reducing required rate of return for the consumer to 5% would still lead to a substantial premium (£550-1100 p.a.) for the electricity option. There are some caveats to this. Heat pumps make much more economic sense off the gas grid (about 10% of households) where they compete with heating oil, or with electrical resistance heating. They also make more sense in very well insulated housing. This will include new-build, where there is the further advantage that the capital cost of the heat pump is more readily accommodated as part of the cost of the building. However the turnover of the UK housing stock is very slow. As a result the contribution that new-build can make is limited, even over a few decades. This additional cost does not bring a better service, and indeed some are likely to find disadvantages. Heat pumps are noisier than gas boilers and run for more of the time, and the radiators to deal with the lower water temperatures are somewhat bulkier. An additional cost of £700-1400 per household every year for something with no advantages and perhaps some drawbacks is likely to be politically difficult to implement. There are clear lessons from these estimates for making decarbonisation of space heating more tractable. First, it makes sense to focus initially on new residential and commercial buildings, and properties off the grid, even if this is a limited market. Second, the benefits of additional insulation become even more compelling, again especially in new build. Third, the benefits of improving heat pump efficiency are huge. Fourth, reducing the capital costs of low load factor low carbon electricity is also essential. In the absence of cost-effective seasonal storage his will in practice require low cost generation from gas with CCS, although biomass generation may also play a role. Proving this technology at scale and achieving capital costs well below those of other low carbon generating technologies looks to be essential if seasonal heating is to be decarbonised at acceptable cost. Fifth, any technology for storing energy seasonally, for example as hydrogen or methane generated electrically or from fossil fuels with CCS, would be potentially transformative for decarbonising heat and much else if it could be done at very large scale with reasonable cost and energy cycle efficiency. This is currently an underdeveloped area. Reducing the UK’s emissions from space heating by electrification looks likely to require major technological and infrastructure developments. All this is likely to take time, making the need to reduce costs urgent, even if large scale decarbonisation of the heating load is some way away. This needs to be a matter of priority. Other approaches such as the use of biomass and heat networks may also play a significant role in decarbonising winter heating, although there is not space to cover them fully in this post. Each approach has its own challenges. Heat networks could be fed by natural gas with CCS, either producing heat only or combined heat and power. This requires new heat networks serving urban areas, as well as a CO2 transport network covering large parts of the country, which will be much more expensive than would be required if only large central generating plant were to have CCS. In some other parts of Europe there are more existing heat networks, reducing costs there, although very extensive CO2 transport networks would still be required in most cases. Use of biomass directly for space heating may also play a role, but is unlikely to predominate in the UK, for example due to the lack of storage in most UK housing, the scale of the demand, and in some cases problems with high lifecycle emissions. Air source heat pumps look to be the most promising technology for very widespread electrical heating, although ground and water source heat pumps and resistance heating will have a role. Reliance on resistance heating would make the problem of very large demand for expensive winter-only electricity demand much more severe. Around 150TWh more gas is used (outside power generation) in the first quarter of the year than in the third quarter. Replacing this much gas requires around 45TWh of electricity if heat pumps are used. This adds about 50% to present electricity consumption of around 85TWh in the same period. The calculation of additional electricity demand assumes that additional non-power sector gas demand in the first quarter compared with the third quarter is due to the heating load. Totals quoted are an average of 2013 and 2014. For peak heat demand of 300GW see http://www.eti.co.uk/wp-content/uploads/2015/03/Smart-Systems-and-Heat-Decarbonising-Heat-for-UK-Homes-.pdf, page 11. I’ve assumed a 33% load factor (equivalent for running 4 months of the year, from mid-November to mid-March) for electricity to serve heat load. This assumes that capacity can run continuously at full load during these months, which is unlikely to be the case for most capacity due to variations in demand within day and across days. The assumption here is thus likely to be somewhat favourable. Diurnal storage may help achieve smoother output but will add further to costs. Full system modelling would be required to estimate the cost of low load factor electricity accurately, but would be unlikely to change the conclusions, especially for such a large change to the current system, and if anything would be likely to raise costs assumed here somewhat. The amount of decarbonisation also matters. Allowing some emissions from fossil plant running during the periods of highest heat demand, or allowing top-up from gas boilers, can reduce costs. Hinkley C nuclear plant has a cost of £92.5 per MWh escalating with inflation. This price is after other support in the form of loan guarantees. Without this support the cost would be higher. 85% of the cost is capital and fixed operating costs. Costs of early CCS are expected to be higher than the figure quoted here, but there are ambitions to reduce this to £95/MWh by 2030 for gas with post combustion CCS. See https://www.gov.uk/government/uploads/system/uploads/attachment_data/file/223940/DECC_Electricity_Generation_Costs_for_publication_-_24_07_13.pdf . However this looks likely to require substantial learning. The capital cost of £1300/kW assumed by DECC for gas plant with CCS appears to exclude transport and storage costs and to include some early stage appraisal optimism. I have therefore adopted a capital cost of £1950/kW ($3000/kW) including transport and storage, though reducing fuel costs to retain a total cost of £95/MWh in baseload. Getting the total capital cost down to this level would be a substantial achievement. In short, most of the assumptions for the cost of electricity generation to serve heat load seem to tend towards the optimistic. Heat pump and gas boiler system cost calculations are approximate only and will vary greatly with circumstances. More detailed modelling would refine them but would be unlikely to change the overall conclusions. The costs exclude the effect of any incentive payments. Annuitisation of capital costs for domestic consumers assumes a 10% rate of return required over 15 years, with a sensitivity to lower rates of return noted under the chart. Domestic consumers are likely to require higher returns than this in practice, but financing schemes may be made available to reduce their cost of capital. The change of rate of return assumption does not apply to power generation. Average household gas consumption is from http://www.carbonindependent.org/sources_home_energy.htm Mean rather than median consumption is estimated. Ofgem use a somewhat lower figure based on median consumption. Typical gas consumption includes some hot water and often cooking use. I’ve largely ignored these factors, which complicate the story somewhat, but again do not change the nature of the central challenge. This entry was posted in Climate change policy on 18/05/2015 by adamwhitmore.